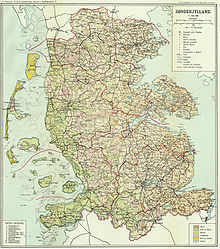 Picture - Map of Schleswig / South Jutland before the plebiscites. The Schleswig Plebiscites were two plebiscites, organized according to section XII, articles 109 to 114 of the Treaty of Versailles of June 28, 1919, in order to determine the future border between Denmark and Germany through the former duchy of Schleswig. The process was monitored by a commission with representatives from France, the United Kingdom, Norway and Sweden. Picture - Results of the plebiscite. The plebiscites were held in two zones that were defined by Denmark. according to the ideas of the Danish historian Hans Victor Clausen Zone I was dimensioned as far towards the South as possible, therefore changing the Clausen-Line southerly from Tondern instead of northerly, and had to vote en bloc, i.e. as a unit with the majority deciding, while in the following smaller Zone II each municipality was to decide its own allegiance, this procedure allowing Denmark to gain further territory and put the frontier further southwards according to eventual majorities in northern municipalities. The first plebiscite was held in Zone I, the later Northern Schleswig on February 10, 1920. 74.9 % (75,431 votes) of the public voted to come under Danish rule, 25.1 % (25,329 votes) to stay German, although in three of the four major towns and especially in the southern region directly at the frontier to Zone II German majorities existed, especially a large German majority between 70 and 80 percent in and around Tx�nder and Hx�jer. It was mostly this area that caused discussions after the voting, especially as this area had been regarded also by Clausen to be south of an imaginary German-Danish border. Central Schleswig (Zone II) voted on March 14, 1920. 80.2 % (51,742 votes) fell to Germany, 19.8 % (12,800) to Denmark. Since a Danish majority in this zone was only produced in three small villages on the island of Fx�hr not aligned with the coming border, the Commission Internationale de Surveillance du Pl�biscite Sl�svig decided on a line almost completely identical to the border between the two zones. The poor result for Denmark in Central Schleswig - particularly in Flensburg, Schleswig's largest city - triggered Denmark's 1920 Easter Crisis. A plebiscite was not held in the southernmost third of the province (Zone III) as there was no doubt about the outcome. District Flensburg / Flensborg, northern part: 40.6 % (548 votes) Germany, 59.4 % (802 votes) Denmark. Town of Flensburg / Flensborg: 75.2 % (27,081 votes) Germany, 24.8 % (8,944 votes) Denmark. Directly after the announcement of the results from Zone I, an alternative draft for the frontier was made by the German historian Johannes Tiedje. The proposed frontier would have incorporated Tondern, Hoyer, Tingleff and neighbouring areas and also some parts northern from Flensburg - the so called Tiedje Belt - and would have created almost equal minorities on both sides of the frontier instead of 30,000 to 35,000 Germans in Denmark and 6,000 to 8,000 Danes in Germany. This and suggestions like this were not accepted and so Northern Schleswig was surrendered to Denmark on 15 June 1920, and the territory was officially named the South Jutlandic districts, more commonly Southern Jutland, although this name is historically identical to the whole of Schleswig.